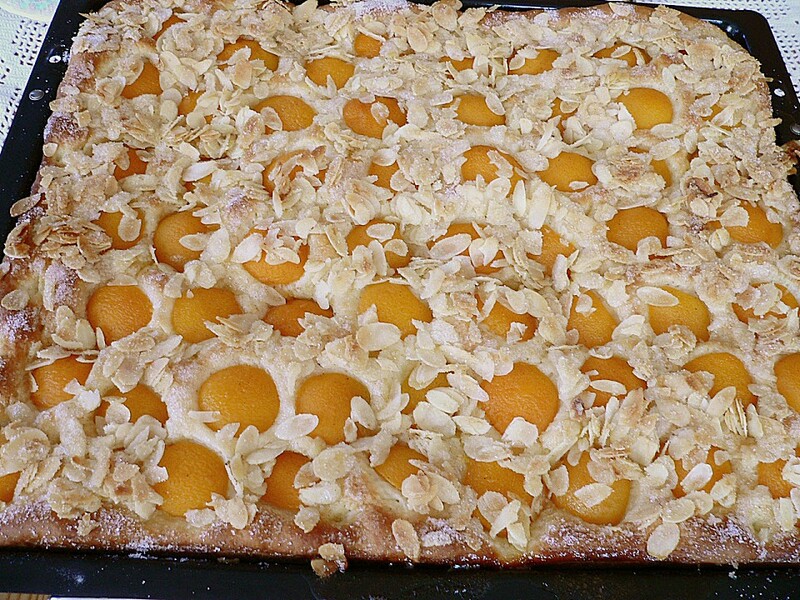 The Apricot Butter Cake is an Authentic German recipe, yes and it is one of the great recipes. The cake is a yeast dough with apricots on top, you can use ripe and fresh or canned ones. Happy Baking! - Melt 50 g butter, warm milk a little bit, dissolve yeast in milk. - Mix flour, 50 g sugar, salt, lemon zest, cooled off butter and yeast-milk, mix with the hand mixer using kneading hooks for 5 min until you get a smooth dough. - With hands knead the dough very well, place in a bowl, dust with flour, cover with a kitchen cloth and let raise at a warm place for 30 min (should raise to double amount). - Knead dough again very well. Sprinkle flour on hands. Spread dough on a greased deep baking tray (size 40x60cm). - Drain apricots, if they are not in halves cut in halves. - Gently press them into the dough. - Let dough raise again 15 min. - Cut cold butter in small cubes. - With a wooden spoon press little molds into the dough in between apricots. - In each mold place a butter cube. - Sprinkle with almonds and 150 g sugar. - Bake in pre-heated oven on 350 F for about 20 min until the cake is golden brown. - Let cool off before cutting it in rectangle shaped pieces. Tip: Place a fire proof bowl with water in the oven while cake is baking. It makes the cake even better. Serve with whipped cream!